Crafting Adventures: Whimsy Digi Image Release Party Hop! Welcome to our fabulous Whimsy digi image release party! If you have hopped to me from Deb's blog, that is great. Please keep reading. However, if you have just stumbled across my little patch of the www without first checking out my fellow DT-ers work, you will need to go right back to Crissy's blog at the start of the hop. Today we are showcasing a new digital collection with exclusive designs from Crissy Armstrong, Katie Sowa, and Ann Vento as well as some others from Whimsy's previous rubber stamp collections. All will be available for download upon completion of purchase. Each download will contain a zip file with 3 versions of the image, a JPEG, TIFF, and PNG all at 300dpi resolution. Images can be flipped, rotated, or resized to fit project needs. The card I have chosen to share with you uses one of Crissy's images and one of Ann's awesome sentiments, which are taylored to tie in with the image collections. This image is appropriately titled 'Gift Horse' and I had so much fun colouring him in! I was also very brave and chopped up these DCWV papers which I've had for a couple of years but never managed to use before! For some reason, they never seemed to sit right together. I'm really pleased with how it all turned out this time though and even happier that I also managed to create some flower embellies from the papers too! That will be that DCWV paper then...! Something Completely Different - The Letter 'B'. It's that Blossoms & Butterflies paper again! Digi Stamp: Gift Horse, available here from Whimsy Stamps. Sentiment: Gift Horse Sentiments, available here from Whimsy Stamps. Paper: Blossoms & Butterflies - DCWV. Copic Markers: E29, E31, E33, E35, E37, R81, R83, R85, G00, G02, G05, Y17, Y21, B60, B63, C1, C3, C5, C7. Crissy's Digi "Pebbles the Cat"
Katies's Digi "Awww, So Tweet!" Ann's Sentiments "Mother's Day Sentiments"
In addition, there is a freebie set of sentiment digi's lurking somewhere along the hop, just waiting for you to find and download them.... we spoil you, don't we?! Really fun card Stacey-love it! Those papers go so well! I love this image! Wow Stacey!! Your coloring and combo of paper rocks!! Just love your cheery colors and how you colored the sentiment and adorable horse. Awesome job on you blog hop creation! ur card is super cute! What a fun card! I love these colors. 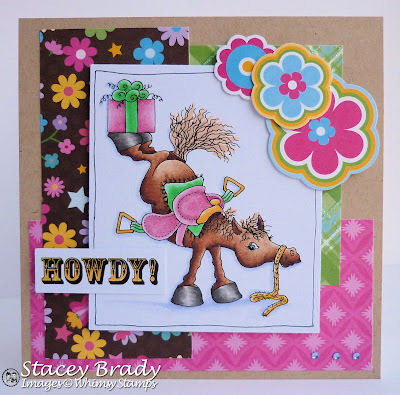 I love that it's such a girly card... and we usually tend to use boyish colors for cowboys... just love one good cowgirl card! what a happy card beautiful paper and coloring. Stacey, your card is adorable! Love that horse and your coloring is gorgeous! Love how bright and fun it is! Fabulous card! AWWW how fun LOVE LOVE the bright and cheerful colors!!! Just wonderful! Super vibrant colours, these images are fab! so fun and sassy! love the colors and fun layout! what a great image - such fun and so cute - thank you for joining us at SCD this week. Great card! The coloring and shading are perfection! Lovely bright colours - another very different take on B ! I love the bright colors you used on this. Fun Fun card!! Wow this card rally pops - how bright and cheerful is that! Absolutely stunning card Stacey! Your colouring is just divine! Oh I love this card. Those colors are great. TFS. this is so cute! love the color so bright and festive!! Stacey...this is so cute! I love your coloring and the fun color palette you chose! So sweet! Hi Stacey, what a fun cheerful card, loooove the pretty papers and your coloring ROCKS!! The papers you used on here are so fun and fabulous! Love this image! I've never entered a challenge so it amazes me how you can create a card that fits so many requirements. What gorgeous coloring--and adorable card. Oh what a fun image and love the vibrant colours Stacey. Great color choice! Stunning card!! Wonderful card, love the coloring and the image! Stacey, you always know how to put together such bright and clean cards! This is so beautifully done, great job! Really cute love the colors. Love the horse and how you coloured him, he's just adorable! very very cute Stacey! Love your sweet blog! You've really captured the party feeling with those gorgeous bright colours Stacey. This card is just fantastic! It shows the image off perfectly. Fab card Stacey and the papers tie in really well with your colouring, great use of embellishment too!